Property Award Nominations 2018 - Pygott & Crone - Houses. Homes. Harmony. Pygott and Crone Estate Agents have been nominated for multiple property industry awards. The directors and staff at Pygott and Crone are delighted to have been nominated for multiple awards at two separate prestigious events. The UK Property Awards 2018 held at the Royal Lancaster Hotel in London on 26th October and at The Negotiator Awards 2018 which takes place on 30th November at the Grosvenor House Hotel in Mayfair, London. Pygott and Crone will compete with the best Estate Agents in the industry hoping to be crowned The Best Real Estate Agency in Lincolnshire by the UK Property Awards judges. The International Property Awards are open to residential and commercial property professionals from around the globe. They celebrate the highest levels of achievement by companies operating in all sectors of the property and real estate industry. An International Property Award is a world-renowned mark of excellence. 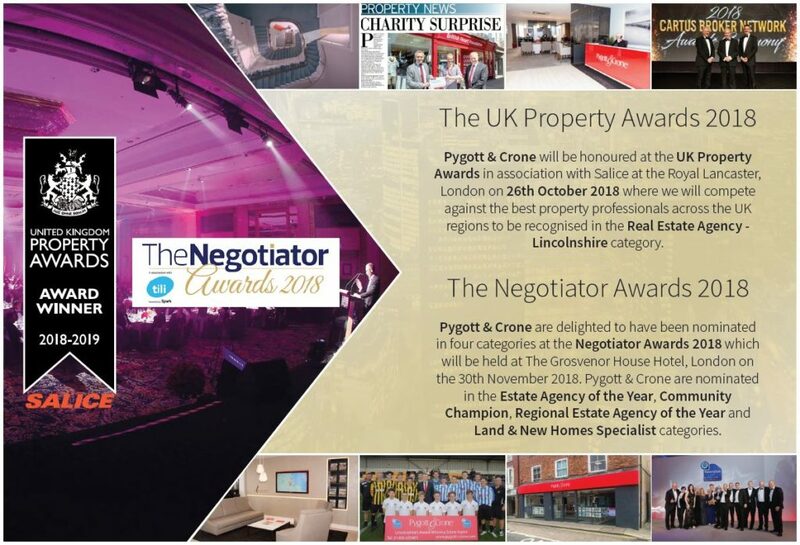 In November, Pygott and Crone will return to the London to attend The Negotiator Awards 2018. Shortlisted in four seperate categories including: “Estate Agency of the Year”, “The Community Champion”, “Regional Estate Agency of the Year” and in the “Land and New Homes Specialist” sector. The judging took place on 4th September 2018 at the Royal Automobile Club, Pall Mall, London where the Shortlist was decided by a panel of judges and observers from The Negotiator. The three finalists and winners of each category will be revealed at a grand gala dinner at the Grosvenor House Hotel, Park Lane, London on 30th November 2018. Established in 2008, The Negotiator Awards has become the most prestigious awards ceremony for the UK residential estate and letting agency industry.